I remember the first time I had to say a difficult goodbye. It was the day the social workers came to take me into government care at thirteen years old, after I disclosed my Father was sexually abusing me. They came and explained why they were there, and gave me ten minutes to pack some of my belongings to leave my home. I remember feeling sadness and relief that the nightmare that I physically endured was at an end, but at the same time, immense sadness and fear at leaving the only home I had ever known. It was hard, painful, swift but totally necessary. That goodbye saved my life. 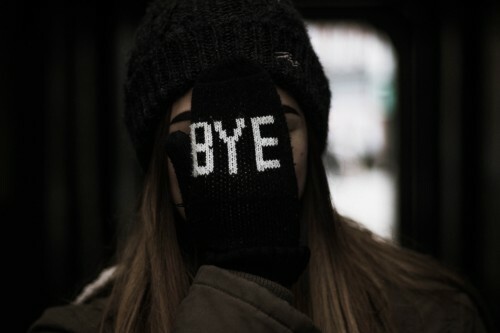 Saying goodbye does not just permit to relationships. It could be parting ways with destructive habits, addictions or anything else that has a negative impact on your life. I remember the feeling smoking weed gave me. I first started smoking it at 14 years old, and I remember how it made me feel calm and peaceful; it seemed to give me respite from my troubles. I was confident, relaxed and less agitated when I smoked, and soon enough I became emotionally dependant on it. It was only after I gave my life to Jesus at twenty-one years old, that I was able to break free from my dependence on it, and draw upon the peace he gave me, rather that the false peace I was getting from smoking weed. For those seven years, I was able to keep numb the pain and avoid dealing with the challenges left behind from abuse, but it came to a point where I had to make a choice to say goodbye to it. I also found it hard to part with dysfunctional and destructive relationships. I knew these relationships were emotionally and mentally hindering me from healing from my past, but for the longest time, I held on to them. Because of low self-esteem I believed seeking approval was part of the price I had to pay for speaking out about my experience; I did not want to be rejected: I had been rejected so many times already. But in the end I chose to fight for me and let go of these relationships. For many survivors, I believe, the difficulty in saying goodbye comes from fear of living life unknown without the very thing- whether good or bad, that they have drawn dependence, developed an attachment to. Are you are currently in this dilemma? Torn between doing what is best for health and self? It is totally understandable to feel conflicted but ultimately, holding on to destructive relationships and habits will have negative consequences in your life, for in order to keep them will always involve a compromise on your part. So how do you recognise it may be time to say goodbye? I would suggest evaluating whether the relationship, habit or dependency is adding anything beneficial to your life. If it is causing you emotional distress, exacerbating mental disorders such as anxiety or depression, causing you to seek comfort in misusing substances or generally making you unhappy, these are good indicators. In the area of relationships, if the other party is not interested in having an open and honest conversation about issues surrounding your relationship and do not see anything wrong with the distress and emotional harm it is causing you, then it is time to distance yourself. You can discuss your decision beforehand with someone you trust, a counsellor (referral made through G.P) but for specialised counselling (sexual abuse related issues/complex relational dynamics due to abuse) you may have to pay for it yourself. Other options include calling or emailing support organisations like Daughter Arise, where you can talk confidentially or you may want to write down the positives and negatives of your situation in a journal if you have one, and come to a conclusion yourself. So what have I learned about goodbye? I have learned that in order to grow and progress, goodbye is a natural part of the cycle of life. It is not sinister or dismissive; it all depends on where you are in life and whether whatever it is- people, habits, coping mechanisms, behaviours are helping you to grow into the promise of the person you aspire to be. Everything concerning life is for a reason and a season. As we grow and develop, learn more about ourselves; likes and dislikes, dreams, hopes and aspirations, these factors help to initiate decisions that form part of change. As you develop healthy self-esteem and confidence you will feel more assured of your choices and less fearful of saying goodbye to anything that does not fit in with what you envision in your life. I can honestly say that working on my self-esteem and confidence over the years has helped me to be assertive about what I will and will not allow in my life. This does not mean the process is easy, as a matter of fact it is hard, because it goes against what you feel, and may go against what others want. But with support and help, especially in the area of addiction, it can be done. Goodbye does not have to be a negative experience; something good can be found in saying Goodbye. So well written. Valuable advice. I think we all struggle to say goodbye to dysfunctional relationships. The tips on how to tell if you need to let go is essential reading. Another fabulous article.